* Meet existing greenhouse gas reduction agreements. The statement builds on recent agreements, including California’s Under 2 Memorandum of Understanding, which stresses the need for immediate action to limit global warming to 2°C, and the Compact of States and Regions, which commits partner jurisdictions to annual public reporting of greenhouse gas emissions. The statement calls for greater national action at the United Nations Conference of the Parties in Paris, and support for regional measures. 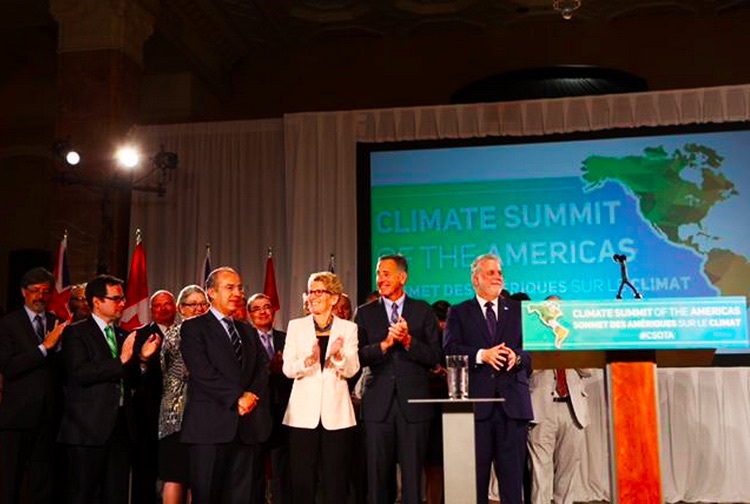 It also builds on Ontario’s actions to address climate change, which include the announcement of a cap and trade program to limit the main sources of greenhouse gas pollution, the establishment of a 2030 mid-term target for greenhouse gas pollution reduction, the closure of all coal-fired power plants and the largest infrastructure investment in Ontario’s history, which includes the electrification of the province’s commuter rail network. Combatting climate change is part of the government’s economic plan to build Ontario up. The four-part plan includes investing in people’s talents and skills, making the largest investment in public infrastructure in Ontario’s history, creating a dynamic, innovative environment where business thrives and building a secure retirement savings plan. Combatting climate change creates new economic opportunities in renewable energy and clean technologies. Ontario’s environmental sector has 3,000 firms, employs 65,000 people, and is worth an estimated $8 billion in annual revenues and $1 billion in export earnings.